Emerging Energies of Wisconsin recently invited the employees of AlignTech Solutions to visit its latest wind farm in the Town of Shirley, Wisconsin. And so we went. Emerging Energies is just now finishing a project in Shirley — a farming community south of Green Bay — to raise eight wind turbines. I love learning new things, so I was really excited to get to see first hand a technology that Europe’s been innovating around for quite a long time. Several years ago while visiting Amsterdam and The Haag, I learned that the Dutch have a long and successful history of using wind energy (as well as, apparently, some nifty engineering concepts for keeping the North Sea out of some very New Orleans-like places in The Netherlands). Some of their oldest windmills appear to be hundreds of years old. The newest ones — which look just like the ones Emerging Energies is now erecting — dot their beautiful landscapes. Shirley reminds me of Gordon, Nebraska, and many other small towns in the Midwestern U.S., where the crossroads sports a grain mill and a number of smiling faces. Residents of Shirley and the surrounding area are about to become the proud neighbors of some impressive-looking wind towers. So what are these turbines like? Wind Shadow Just like in the world of racing sailboats, where a “wind wake” or “wind shadow” can cause destructive interference with other boats that follow behind a lead boat (the one creating the wind shadow), a wind turbine’s wind shadow can reduce the relative effectiveness of other turbines if they are placed too close to one another. The rule of thumb in Wisconsin appears to be “40 acres needed per wind turbine” because of this wind shadow. Light Shadows I just learned about this one: Given the time of year, the angle of the sun and the position of a residence near a turbine it is possible for a turbine to cast rotating shadows (remember the movie Casablanca? With the ceiling fans? ), or a sort of strobe effect, that may annoy a homeowner. Fortunately, there is programming available that can largely mitigate this effect. Noise Factor At 1000 feet from the base of a tower, and when the rotors are turning at full speed, the noise signature is 50 dB(A). That’s 50 decibels for us humans. Well, so what? How loud is that? Normal conversation is between 60 dB(A) and 65 dB(A). A lawn mower is around 90 dB(A). When a train goes by the house my brother and sister-in-law live in, that is over 100 dB(A) and we all have to stop our conversations. The loudness of a wind turbine is much more like a refrigerator motor running. Not too bad. Stray Voltage Stray voltage is a really big deal if you happen to be in the dairy business or have other farm animals. No one disagrees that stray voltage adversely affects animals — and probably people too — but stray voltage is a phenomenon that relates directly to how a farm is wired (and grounded). See these articles by Noble Power and Renew Wisconsin for some discussion on this. Here’s what stray voltage is Not… It is not related to the wind turbines. Why not? Because power generated by the turbines is transmitted back to the energy companies by way of shielded wires underground. The greatest electrical effect we can hope for from this transmission would be an induced magnetic field. And is this field egregious or beneficial? This Windrush Energy research says it’s not harmful. Birds and Bats Just how fast are those rotors turning? At maximum velocity, they can turn at 15 RPMs (revolutions per minute). This is not nearly the speed at which a house fan’s blades become “invisible” to us humans. Are there bird and bat deaths due to these rotors? Yes. But according to Leslie Garrett of GreenMuze, there are a number of other tall structures, like buildings, that are far more dangerous to birds and bats. Having started my career in the nuclear power industry, where power companies used to use a public relations staff member as their only mouthpiece, I was pleasantly surprised to find that Emerging Energies has developed solid relationships with its neighbors in Shirley. 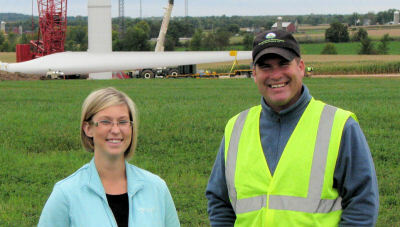 According to Jay Mundinger, one of the founding partners at Emerging Energies, “Education is a big part of what we do.” Jay also said that they work one-on-one with the town and landowners on the placement of the turbines and to help ease the burden of those people who will be inconvenienced during the construction phase. One example of this… Emerging Energies recently used top soil recovered during construction to fill in some low spots in one of its landowner’s fields. Out of the entire structure, only one part of a Shirley Wind Project’s wind turbine is made outside of the U.S. and that is the nacelle. It is still made in Denmark. Those enormous rotors are made in Arkansas. The towers are manufactured by Tower Tech Systems in Manitowoc, Wisconsin. They actually added 30 jobs recently to handle the work volume. Go jobs in Wisconsin!! When the wind is too light or too heavy, the turbines prevent wasteful motion and protect themselves by changing the pitch of their rotors. When the rotors are pitched “fully in” (this is my interpretation), the rotors can’t move. This is also how specialized programming can help mitigate strobe effects on certain residences. There are actually Many more than just 5 interesting facts in this post. But 5 is a nice number to use in a title. Thanks to Jay Mundinger, one of the founding partners at Emerging Energies, for giving us the grand tour earlier this week.